Aligarh: Many young poets from the Aligarh Muslim University (AMU) and the Aligarh city came together to recite for change in English, Hindi, Urdu, Kashmiri, Assamese, Punjabi, Marathi, Bengali and other languages as a part of the ‘100 Thousand Poets for Change’ to express their ideas for peace, prosperity and progress at the Strachey Hall. 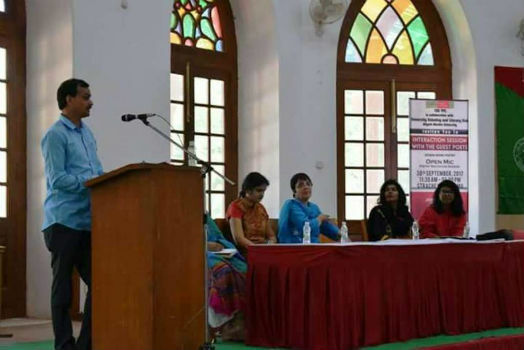 The poetry reading session organised by the University Debating and Literary Club (UDLC) and Cultural Education Centre (CEC) in collaboration with the Global Poetry Forum was one of the 700 such events taking place in 600 cities of 95 different countries. A special highlight of the event was the session in which Prof Sami Rafiq and Dr Aysha Munira Rasheed (Department of English) recited translations in Urdu and English of some of the best poems on peace, justice and sustainability. Another attraction was the English translation of AMU Tarana, by Prof Sami Rafiq, which was sung to a good effect in the hall. Sudhanshu Firdaus (Research Scholar, Jamia Millia Islamia) and Dr Jyothsna Phanija (Assistant Professor, Delhi University) read peoms from their collections with simple and deep meanings leaving the audience enthralled. A session in which poets from diverse linguistic backgrounds recited self-composed poems followed. They addressed issues of disability, conflicts, gender sensitivity, communal harmony, mental health and human rights through their poetry. Dr Alisha Ibkar (Assistant Professor, Department of English) and Lubna Irfan (Research Scholar, Department of History) worked tirelessly to make the event successful. The organization ‘100 Thousand Poets for Change’ was conceptualized with the aim of bringing social change through art and to build solidarity amongst artists across the world, who develop and execute substantial and creative means to face challenges. These artists work to overcome violence and wrong doing with art and love and emphazize the need for inclusivity and diversity in their global network. The significance of this endeavour is that it incorporates new and creative means of countering oppressive forces and gives access to to the marginalized in the creative communities.